A shocking new campaign uses images of animals being tortured to raise awareness of the impact of plastic in the oceans. The campaign was created by Sea Shepherd, an NGO focused on the conservation of marine wildlife, which carries out beach clean-ups worldwide among its other activities, which include working with scientists to study the effects of microplastics on marine species. The images - which are not photos - were created by Tribal Worldwide São Paulo and DDB Guatemala. 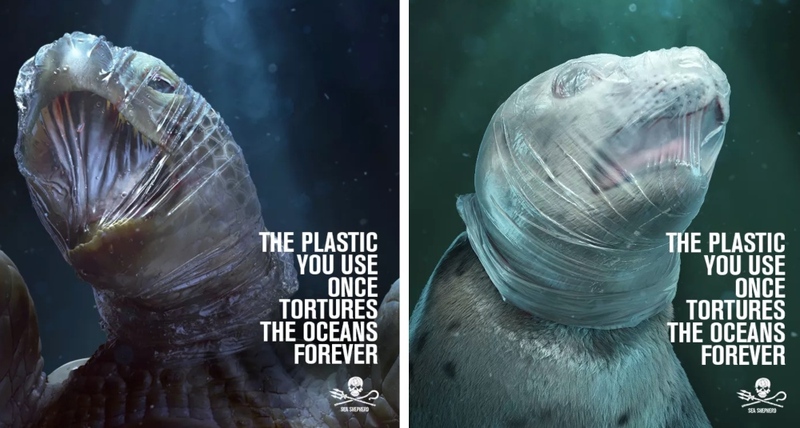 They show animals like seals and turtles being suffocated by plastic bags, alongside the caption: "The plastic you use once tortures the oceans forever." "Unfortunately, a small and thoughtless action in our daily life can cause huge damage to nature without us even realizing it," Guiga Giacomo, Executive Creative Director at Tribal Worldwide São Paulo, said in a statement. "In this campaign, we aim to remedy this by reaching the largest number of people possible, bringing awareness to the fact that with small and easy steps, we can ensure that terrible scenes like these do not happen." "Scientists warn that in 2050 there will be more plastic in the oceans than fish in the sea," added said Sea Shepherd Founder and President Captain Paul Watson. "Sea Shepherd is committed to preventing this from happening – because if the oceans die, we die."